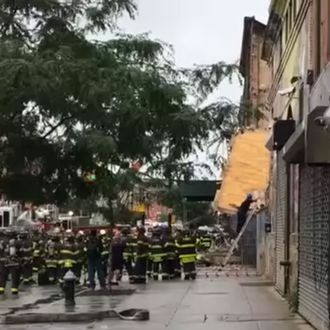 A four-story mixed-use building collapsed in Brooklyn on Tuesday afternoon, reportedly injuring at least three people currently being treated at a local hospital. The building was at 1438 Fulton St. in Bed-Stuy, and reportedly empty and under demolition. There were no life-threatening injuries, and firefighters found no one inside the building. The A and C trains are experiencing some delays because of the collapse, and nearby buildings have been evacuated. #ServAdv: b/d #A and #C trains are running with delays, due to a building collapse on Fulton St. Allow additional travel time. #ServAdv: b/d #A delayed b/d #C bypassing Kingston-Throop Avs, due to a building collapse on Fulton St. Allow additional travel time. Building Collapse By My Job!! !